The Towline recording feature primary use is for the tracking of the usage of the Mainline and the Pennant in order that they are renewed in a timely manner. This is based on the amount of tows the lines are used for. Calculations of Towline usage is exactly the same as that of any other equipment such as a Main Engine or Pump etc whose maintenance is based on a counter. Similar to a Main Engine, the Towline counter is a continuous counter which the user is granted permission to update from its own user interface (as above). The Towline counter is used to schedule the Main Line and Pennant changes. As there is no physical counter to read, the user enters the amount of tow jobs since the last entry as indicated below on the tile (Last Updated (UTC)). 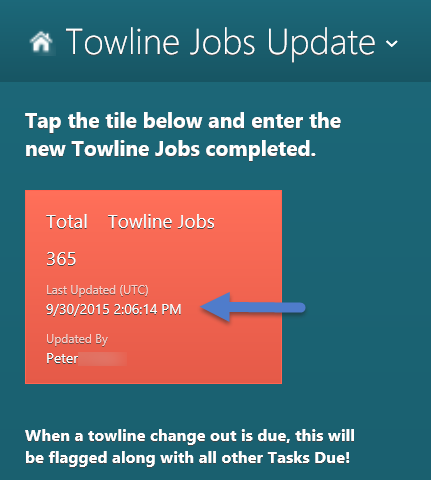 Tap the tile to open the interface and enter the amount of tow jobs since the last update where indicated by the arrow below. 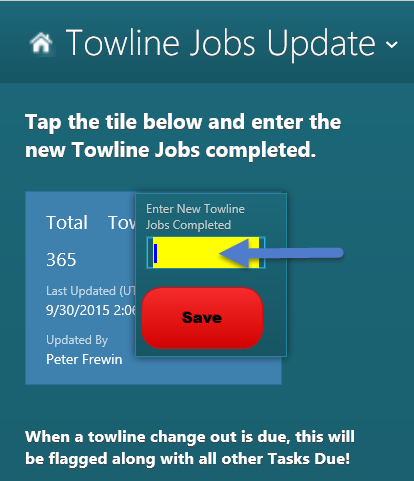 Tap the Save button and this will update the Total towline jobs. When the Towline counter reaches the scheduled Pennant counter reading for change, the Pennant change required will be flagged when checking the Tasks due (Home --> Maintenance --> Tasks Due). A Work Order is raised in the normal manner. Once the Pennant is changed, when closing the Work Order note that the Pennant has been renewed and record the new Pennant certificate number in 'Description of Work Completed'. The Towline counter at the change is also to be recorded when closing this Work Order in the 'Counter At Ohaul' box. Effectively what is achieved when closing the Work Order is that the Pennant counter since last change is reset to 0, The Main Line counter since last change stays exactly the same. When the Towline counter is next increased, the Main Line and the Pennant counters since last change will be increased accordingly.